Caring for an elderly parent can be rewarding, but it can also be completely overwhelming. How to Care for Aging Parents, which has been called “indispensable” by AARP and “the Bible of eldercare” by ABC World News, offers reassurance and support while tackling all the tough issues—finding help, paying for care, exploring housing, talking about money, working with siblings, and more. Need answers? Send Virginia Morris your questions. Fill-in worksheets help caregivers keep track of schedules, medications, daily routines, contact information and more. 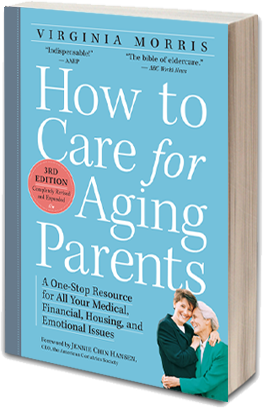 Survival Tips that will help you care for your parent, but also care for yourself.